….. and the back below, showing the covers …..
Last weekend I did a short course in making a screenprinted book and part of the process was the covers. I did the designs with black acrylic paint brushed onto acetate and then scratched into the surface with a nail when it was dry. The hand lettering was done with a Faber Castell Pitt drawing pen. The design on the acetate was transferred to a photo-sensitive silkscreen and printed in white onto a dark cloth. Then the cloth was cut to size and glued to pre-cut boards before being glued onto the concertina screenprint to form the book. The gluing process on the left and the finished back cover on the right. Four ‘layers’ printed, two to go plus the covers…..
It’s the second day of the weekend screenprint book course at Swansea Print Workshop, headed up by Kelly Stewart, and I’m absolutely shattered. We did the drawings and design for it yesterday and today we printed, working at a fast pace in a heatwave! Yesterday, I produced 6 drawn images on acetate for the interior, plus two for the covers. We started today by setting up our work stations, then mixing inks – Daler Rowney System 3 acrylic paint mixed 80:20 with screenprinting medium and a little water to loosen it to a soft dropping consistency, like a Madeira cake mix, I thought. Building on top of what I did yesterday, I scribbled randomly with a white Daler Rowney soft pastel, instinctively concentrating the marks towards the centre. Then I added small amounts of colour – yellow, rose and blue. I don’t know how I’ll use this yet, I might rip it up for collage or I might draw or paint on top. I like the close up digital images I’ve taken. Of course, I could work on this digitally. It’s something I don’t often do but there’s no reason not to. I’m out of my comfort zone here but taking a lead from the Surrealists who used to do creative exercises like this to help them to work from their imagination instead of relying on working from life. It’s an interesting process. I’m doing a short residency at Galerie Simpson in Swansea’s High Street and I’m working on something new, right out of my comfort zone. Here’s the beginning……..
I’m also continuing my “en plein air” journey of discovery with prehistorian Dewi Bowen and filmmaker Melvyn Williams as we travel along the route of the legendary Boar Hunt, Y Twrch Trwyth, from the story of Culhwch and Olwen in the Mabinogion, the book of Welsh mythology, researching, filming and drawing the ancient stone monuments along the way. Coming up to the end of the second week at The Bagpuss Window and I’m getting on with the gigantic wall drawing, worked mostly intuitively. I’ve been pushing out of my comfort zone. I normally work directly from life, small, with fine pens and my drawing can be very tight and controlled. I want to use these few weeks in the old shop to experiment and loosen up my drawing as much as possible. 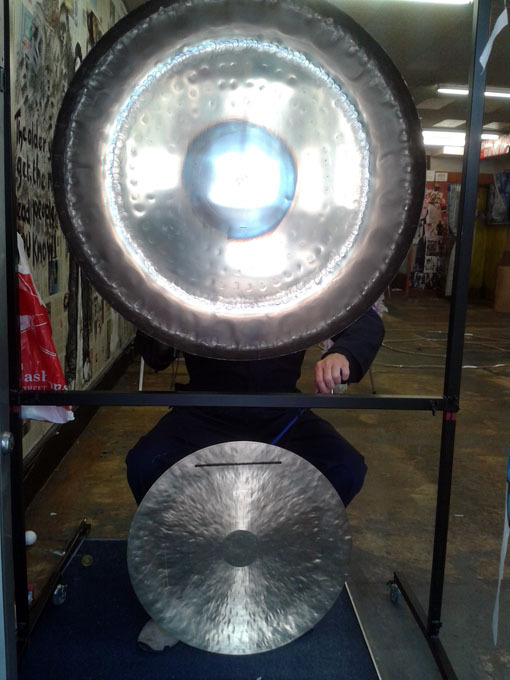 The past few days, we’ve been joined by David Pitt who, amongst other creative activities, plays gongs. Wonderful instruments, such incredible music. He was playing today as I was drawing and I got right into ‘the zone’, carried away by the incredible sounds and drawing automatically. 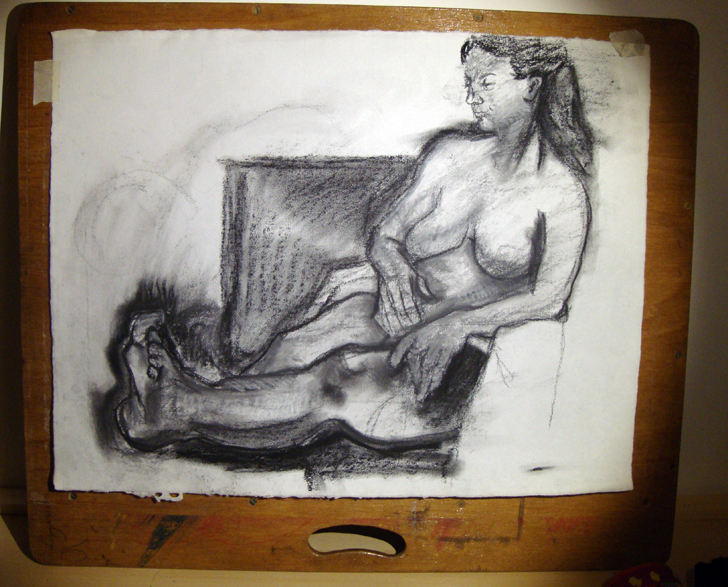 When I looked at what I’d done, it was markedly different to the drawings I’d done earlier in the week, much freer. I used my fingers more, smudging the sparse features rather than fretting over details and doing loads of cross-hatching. It’s been a really good experience so far and there’s so much arty stuff happening locally that Swansea’s being called the new Montmartre. It’s day two of my self-imposed exile from the Galaxy Samsung Tablet and digital drawing. I took my Khadi handmade sketchbook to the beach at twilight with some carbon and chalk. 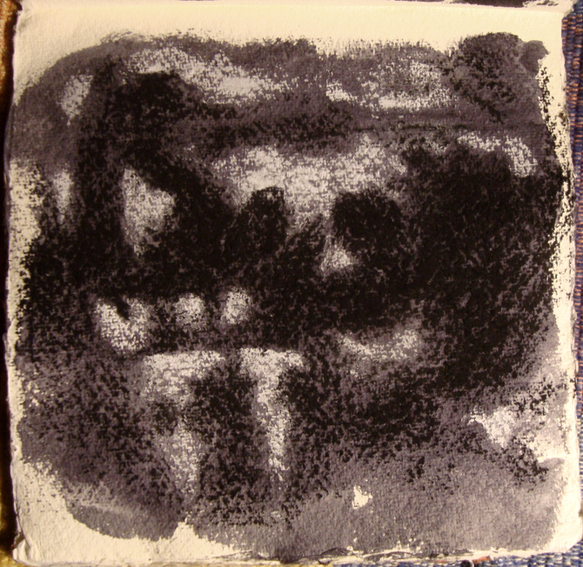 I had prepared the book with a sponge and Indian ink which gives a varied surface on the heavily textured paper. The drawing isn’t an exact copy of what was there but an impression, an interpretation, combining what was in front of me with what was already on the page. That’s a departure for me as well, I rarely work from my imagination. It’s interesting to do this and to see what develops. I think it’s an important part of my practice to push out of my comfort zone and try new things. 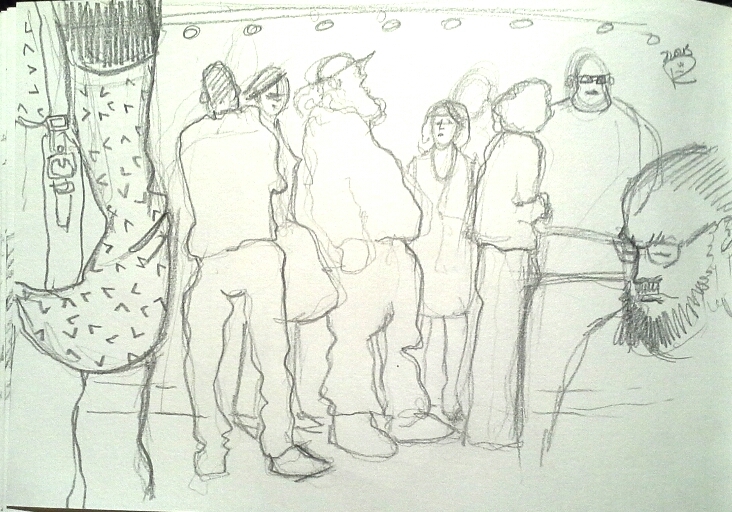 Standing in a queue is a good opportunity to do some crowd sketching. I like to draw individuals because, to be honest, it’s easier. 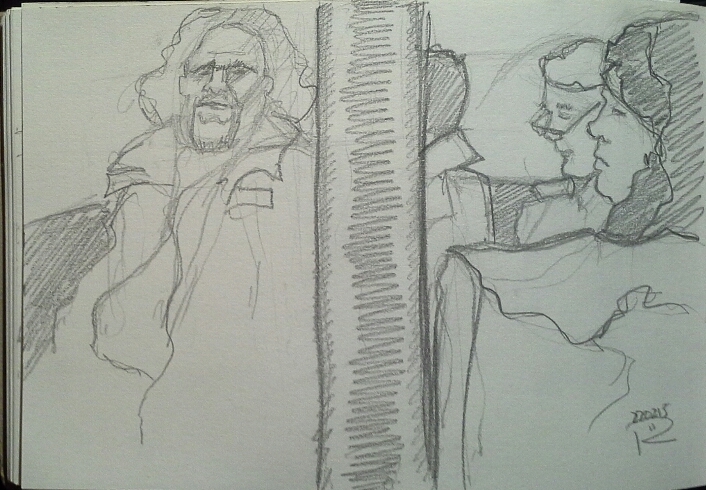 But I shouldn’t stay in my comfort zone so I did these two crowd sketches when I was standing in a queue yesterday. Drawing in a crowd forces you to bring proportion and perspective into the composition. 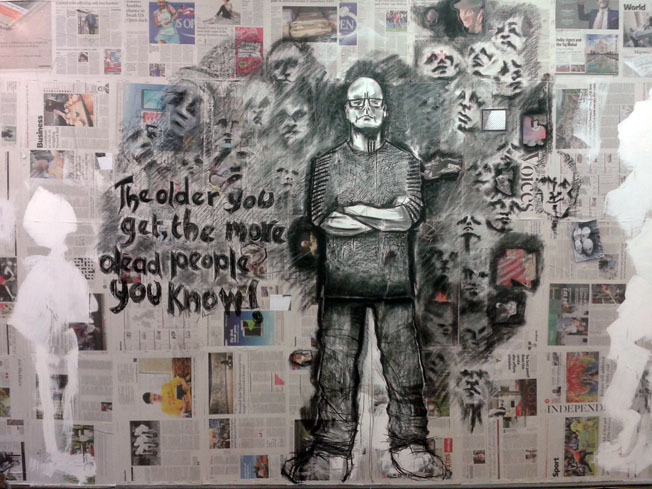 I drew with a graphic stick into my A5 Tate Gallery sketchbook.